Private View: Sunday 7th October 2018, 11am – 4pm. The Exhibition continues until Saturday 27th October, 5pm. Gwyn Roberts was born in 1953 in the Conwy Valley, North Wales, in the stunningly beautiful Snowdonia National Park. From an early age, his love for his surroundings was very apparent and he spent his spare time walking, climbing and immersing himself in the beauty that surrounded him. During the 1980s, Gwyn produced a series of successful fine art screen prints and detailed meticulous paintings of still life and landscapes and he exhibited his work widely in galleries throughout England and Wales. The subsequent demands of family life and a career as Head of Art in large, busy comprehensive schools, meant that for many years he had little time for his own art work. However, an accident, which resulted in the loss of the thumb joint on his right hand, made Gwyn realise that he might never be able to paint again, and this wake-up call made him determined to restart painting seriously. He picked up his old pallet knife, not used since his college days, and began to paint with thick oil paint, something that had been germinating in his head for years. He instantly realised that he had found both the technique and the medium that best represented his feelings and emotions about his subject. Since that time he has been very successful and his work is in great demand. His great love for Snowdonia has always had a huge influence on his work. 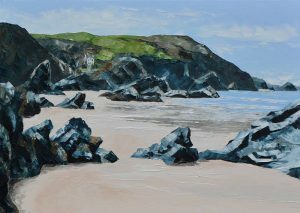 Gwyn also spends much time in West Wales, walking the cliffs of the ruggedly dramatic coastline and he finds great inspiration in the ever-changing light on the sea and rocks. He is widely regarded as a worthy successor to Sir Kyffin Williams. Fellow walkers and mountaineers refer to Gwyn Roberts as “the walkers’ painter” and are said to love his paintings because they depict views that can only be seen after plenty of legwork. While many landscape painters are content to depict the mountains from a comfortable distance, Gwyn prefers to don boots and waterproofs and paint at a high altitude. “I’ve always loved being outdoors in the countryside – and having been brought up in Snowdonia the mountains have been a big part of my growing up experience,” he says. 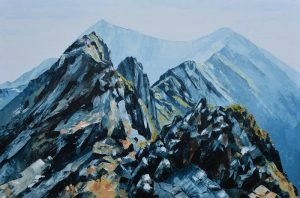 Gwyn’s favourite places to walk and paint in Wales include Snowdon via Crib Goch, the Ceredigion Coastal path near Llangrannog and the Pembrokeshire Coastal Path between St David’s and Fishguard. Painting with thick oil paint, Roberts’ pieces show powerful, atmospheric landscapes: moody, rocky Welsh mountains ….